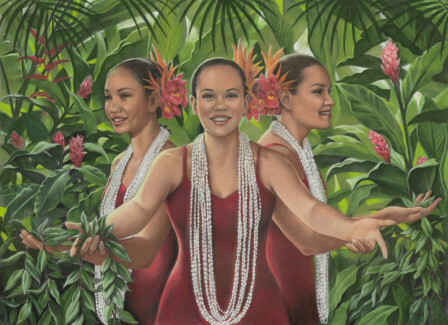 The image, “Hula Sisters”, depicts three of Kumu Hula Nani Lim Yap’s dancers each facing a different compass point, doing an oli aloha, welcoming their hula “sisters” from all over the world to the Big Island, where the Hula was born. This is the Alaka'i (dance leader) of Halau o Kekuhi. She has devoted her life to the study of hula, though right now she is taking a break to find out how the rest of the world lives. She is an elegant, lovely girl with a quiet, sweet spirit and a determined edge. 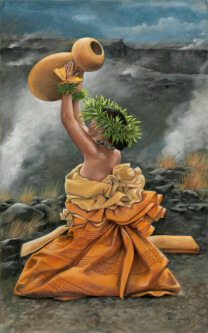 In this hula she uses her pa’u skirt in a movement over her shoulders reminding me of the outstretched wings of a bird. She looked as if she could almost fly off the stage. This image was done at the same time as “Breath of Kilauea”. At the Fire Pit’s edge the heat must have been intense. If you look closely you will see the birds riding the hot air currents as if they were at an amusement park! Against the dark sky the colors of her ancient pa’u skirt and the steam from the vents were startling. 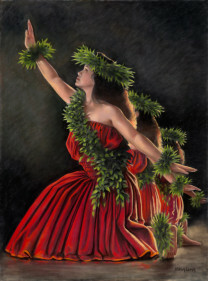 While most people who visit Hawaii experience some form of hula (some of it very good) in their evenings of Polynesian Luau shows, in reality, hula exists casually at real family and community gatherings all over the Hawaiian islands. 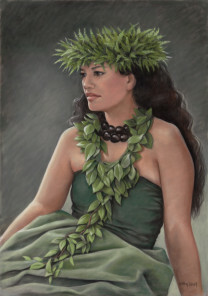 It is also performed with intense perfection at hula competitions, such as the Merrie Monarch Festival, where planning and practice for performing two dances, one ancient and one modern, can take a year. 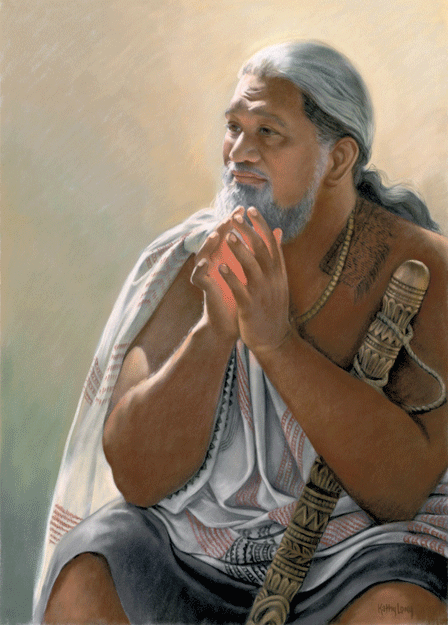 Pau Hula represents that final moment when that year culminates to thunderous applause, as thousands of hours, exhausted muscles, bloody knees, and tired feet all come together in a perfect performance. Our beloved Nohea Amaral Kahiliwai, daughter, wife, mother and dancer, passed away suddenly from cancer. We have eaten many times up at her beautiful home in Koloko, surrounded by the forest and listening to the bird calls. It is so high up the mountain that even my Kamuela hardened body shivers with the cold! We saw, first-hand, her dedication to her husband, little son, mother-in-law. Her ready smile lightened every ones heart. This is the 4th image in my series of Tropical Ladies. Just north, outside Hilo, along the Hamakua heritage Coast, is one of my favorite places on the island. Follow the scenic detour signs and it will take you on a journey through a magnificent, tropical jungle with waterfalls and steams and the beautiful, Onomea Bay. 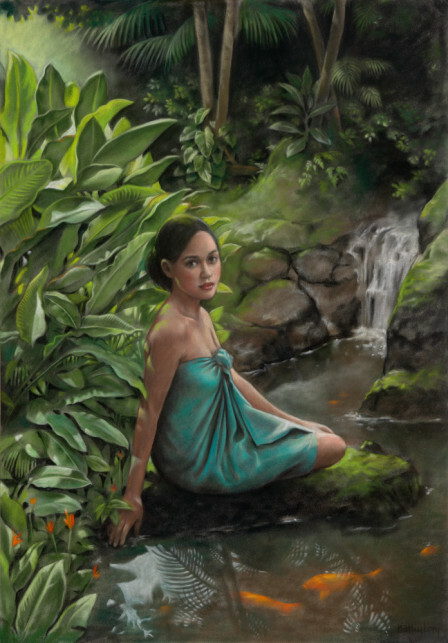 Its green embrace is a balm to the soul and that is where I see my lovely lady sitting in her tropical paradise. 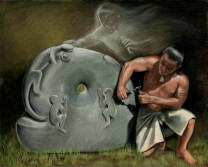 The three men in the image “The Three Kahunas” are teachers of various arts. 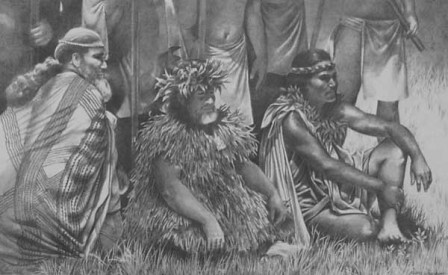 Hale “Harry” Makua, to the far left, is a spiritual kahuna. Sam Kai, in the center, is a teacher of history, as well as the warrior arts. Kia, the man to the right, is a man of agriculture, one of the best known growers of Kalo (poi) in Waipio Valley, where he still cultivates the old Hawaiian way. 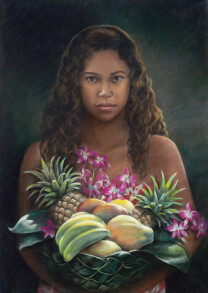 "Basket of Aloha" represents the warm hospitality and generosity of the people of Hawaii. Many of us here are blessed with the overflowing abundance of fruits and flowers in our yards. It is common to find an anonymous box of papayas, a rusty coffee can full of brilliant orchids, or a ripening bunch of bananas from your neighbor left on your doorstep. It is one of the joys of island living. 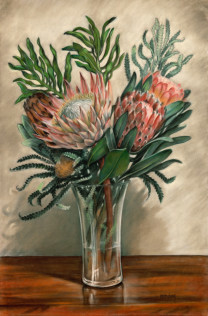 The image "Protea", captures the softness of these exotic flowers that grow in profusion in the cool up-country weather of Kamuela, the place I've called home for over 30 years.